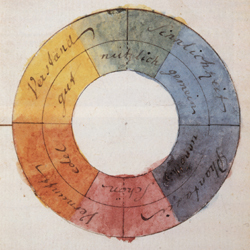 In the occasion of the 200th anniversary of the theory of colours by Goethe there were and are many exhibitions concerning colours, the history of sciences of colours and the phenomenon of colours in general. Colour-classifications made by artists, humanists and natural scientist are both scientifically valuable and an aesthetical experience, which becomes apparent in the exhibition “Farbe: Obsession und Spiel”. An other exhibition in Winterthur is concentrating on the origin and creation of colours. The appendant publication is a sensual experience.